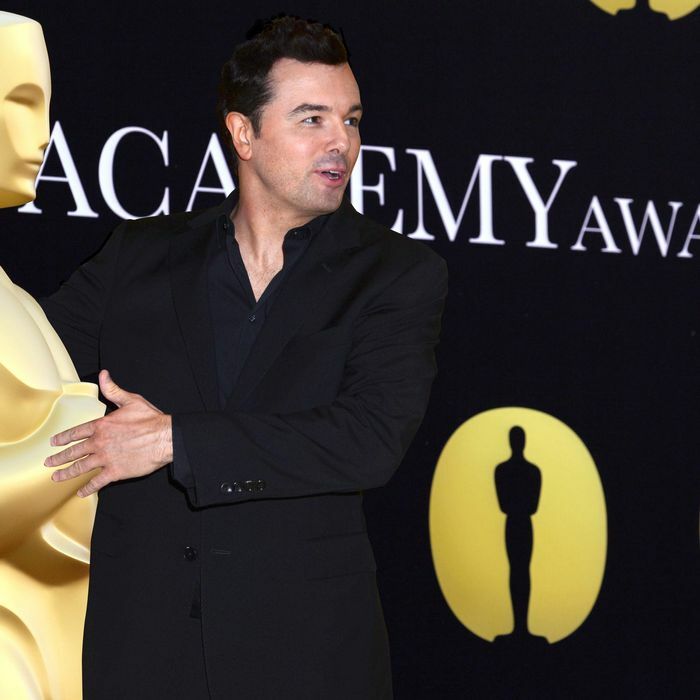 Earlier today, the Academy of Motion Picture Arts and Sciences announced that Family Guy creator Seth MacFarlane would be hosting the Oscars in February, and they have not yet rescinded the offer, so it looks like it’s really happening! Have you adjusted to this new reality? Do you think the choice is actually kind of clever and out-of-the-box, or are you drafting an emergency plea to Hugh Jackman to intercede? No matter how you’re reacting to MacFarlane’s pick, you’ve surely got some questions about it, and we do, too. Here, then, are the top seven things we’re wondering after today’s announcement. Do people actually recognize Seth MacFarlane? The million-dollar question! As far as TV showrunners go, MacFarlane is among the best-known, especially after his recent stint hosting Saturday Night Live. Certainly, people recognize his name: Universal leaned heavily on it to sell Ted, a MacFarlane-directed blockbuster that he voiced but did not appear in. But if you took the guy’s head shot into Times Square and asked people who he was, MacFarlane would almost surely prove to be the least identifiable Oscar host of the last 30 years, bested by a slew of famous comics, talk show hosts, and A-list actors. Picking MacFarlane seems like a blatant move to court the young male demographic least likely to watch the Oscars, but does it mean that you’ll have to explain to your mom who he is? If ABC vetoed Jimmy Fallon, why would they accept Seth MacFarlane? It was rumored earlier this season that AMPAS had pursued Jimmy Fallon to host the Oscars (with Lorne Michaels producing) but that ABC refused to televise an Oscarcast that helped promote a late-night rival to Jimmy Kimmel. While MacFarlane obviously isn’t a late-night talk show host, he is a brand so strongly associated with Fox that the network has basically built Sunday nights around him. Still, there’s no one person who MacFarlane’s Sunday night shows compete with, which makes his selection less objectionable in theory; one wonders, then, whether the Fallon veto came directly from Team Kimmel. How did AMPAS come up with this choice? The trouble with picking MacFarlane is that he’s such a particular selection that you can’t quite hypothesize what led to it in the same way you could if, say, Amy Poehler were the host (which would imply that Tina Fey had been approached first) or if Steve Martin returned (which would mean that more daring picks had said no). MacFarlane told Deadline today that he was approached for the gig right around the time he hosted Saturday Night Live on September 15, three weeks after newly hired producers Craig Zadan and Neil Meron began meeting with potential emcees. That would seem to imply that MacFarlane was a relatively late-surging, out-of-left-field pick, but in the interim, had Zadan and Meron gone after perennial wish-list choices like Ben Stiller and Robert Downey Jr. to no avail? How much singing will he do? The ability to carry a tune is pretty much a requirement from the modern-day Oscar host, but unlike former songbird hosts Billy Crystal, Hugh Jackman, and Anne Hathaway, MacFarlane takes his singing career so seriously that he’s actually put out an album of decades-old show tunes. Plus, Zadan and Meron have a C.V. well stocked with musicals, as they’ve produced Hairspray, Chicago, and Smash. This could be the most sung-through Oscars yet. Which Oscar-nominated movie will MacFarlane make the most vaguely racist jokes about? Beasts of the Southern Wild is probably the runner-up here, just because we think that MacFarlane will be most tempted to somehow conflate Zero Dark Thirty’s hunt for Osama bin Laden with the brown-skinned actors in Life of Pi. Start steeling yourself! What does Neil Patrick Harris have to do to host the Oscars? At this point, Harris has hosted nearly every awards ceremony of note except the Oscars and the Grammys (and the latter kudocast rarely even has a host). However, is that actually working against him at this point? AMPAS has evinced a desire lately to pick unexpected choices like James Franco, Eddie Murphy (though he was hastily replaced by Billy Crystal), and MacFarlane to host, and it’s possible that Harris simply isn’t a surprising enough choice for the organization since he’s done this sort of thing so many times before. It might help, too, if Harris was responsible for a big-screen hit; while he starred in The Smurfs last year, most of the credit for that went to the little blue guys. Will MacFarlane matter that much? Ultimately, any Oscar-watcher worth his or her salt knows that the biggest ratings-driver is always the nominated movies: It’s why some of the most highly rated ceremonies of recent vintage had big blockbusters like Titanic, Lord of the Rings: Return of the King, and Avatar vying for Best Picture. It’s too soon to tell how big the nominees will be this year, but those will surely move the needle more than MacFarlane could. Still, it’s possible that the broadcast could see an uptick in young males; MacFarlane’s Family Guy is the highest-rated show for men 18-34 and also scores highly with teens, and he’s the bro-iest host the Oscars have had in a long while. But while young men may tune in for the monologue at least, can MacFarlane keep their attention as the evening drags on into tech awards and his appearances become less frequent? For that, he may have to break out the Stewie voice.